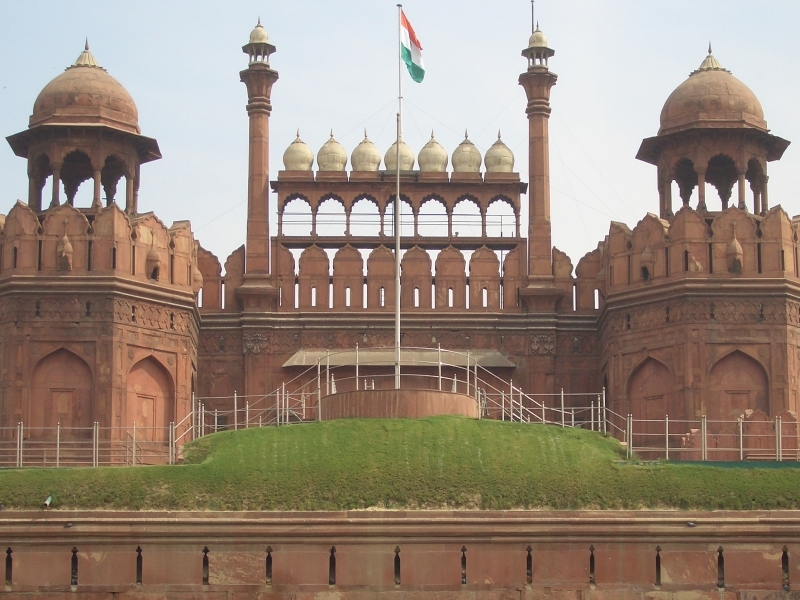 Red Fort is a historic fort in the city of Delhi in India. It was the main residence of the emperors of the Mughal dynasty for nearly 200 years, until 1856. It is located in the center of Delhi and houses a number of museums. In addition to accommodating the emperors and their households, it was the ceremonial and political center of the Mughal state and the setting for events critically impacting the region. Constructed in 1639 by the fifth Mughal Emperor Shah Jahan as the palace of his fortified capital Shahjahanabad, the Red Fort is named for its massive enclosing walls of red sandstone and is adjacent to the older Salimgarh Fort, built by Islam Shah Suri in 1546 AD. The imperial apartments consist of a row of pavilions, connected by a water channel known as the Stream of Paradise (Nahr-i-Bihisht). The fort complex is considered to represent the zenith of Mughal creativity under Shah Jahan, and although the palace was planned according to Islamic prototypes, each pavilion contains architectural elements typical of Mughal buildings that reflect a fusion of Timurid and Persian traditions. The Red Fort’s innovative architectural style, including its garden design, influenced later buildings and gardens in Delhi, Rajasthan, Punjab, Kashmir, Braj, Rohilkhand and elsewhere. The fort was plundered of its artwork and jewels during Nadir Shah's invasion of the Mughal Empire in 1747. Most of the fort's precious marble structures were subsequently destroyed by the British following the Revolt of 1857. The forts's defensive walls were largely spared, and the fortress was subsequently used as a garrison. The Red Fort was also the site where the British put the last Mughal Emperor on trial before exiling him to Rangoon in 1858. Every year on the Independence day of India (15 August), the Prime Minister hoists the Indian "tricolour flag" at the main gate of the fort and delivers a nationally broadcast speech from its ramparts. It was designated a UNESCO World Heritage Site in 2007 as part of the Red Fort Complex. Been to Red Fort (Lal Qila) ? Share your experiences!